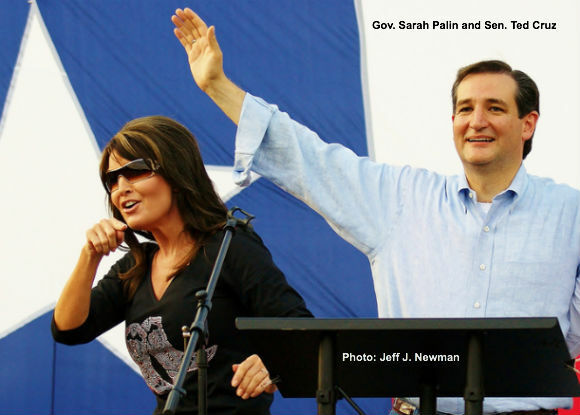 “Boat rockers” Sarah Palin, Ted Cruz, Rand Paul, Dr. Ben Carson and Col. Allen West continue to lead the CHQ 2016 Republican presidential straw poll, with establishment figures like Jeb Bush, Chris Christie and Senator John Thune well down in single digits. Palin and Cruz are the only two potential candidates to break 30 percent, with Palin still in the lead at 39 percent and Cruz gaining ground to now stand at 30 percent. Senator Rand Paul of Kentucky continues to hold third place with 22 percent, virtually unchanged over the course of several weeks. Dr. Ben Carson and Col. Allen West round out the “boat rocking” top five standing at 10 percent and seven percent respectively. We think it portends well for Republican chances in 2016 that the common trait among the top five vote-getters in our straw poll is that they are all “boat-rockers” of a limited government constitutional conservative bent – the establishment Republicans on the list have been relegated to the bottom of the list. In our opinion voters are rejecting the Republican establishment and its brand of Big Government “me-too-ism” in favor of candidates who are authentic representatives of the grassroots conservative base of the Party, and it is that authenticity that keeps Governor Palin in the lead. This is why big government establishment Republicans like Jeb Bush are at the bottom of the list, and of course Marco Rubio’s abandonment of limited government constitutional conservative principles to become the face of the hated “Gang of Eight” Obama – Rubio amnesty for illegal aliens bill has made him anathema to most limited government constitutional conservatives. In our view, the voter’s search for authenticity will be the determining factor in the 2016 Republican presidential primaries. That search is not over and has left plenty of room for non-traditional “boat-rockers,” like Dr. Ben Carson and Col. Allen West, to grow and for other “boat-rockers” on the national stage, such as Senators Paul and Cruz, to continue to challenge Palin for the lead. Vote in this week's NEW poll here. Submitted by treeofdeborah on Thu, 08/01/2013 - 15:40. I would like to see Sarah run for president against Hilary. The glass ceiling for women would then be shattered because those men who are sexist will have no choice but to vote for a women. More importantly, everyone knows where Sarah stands. She is as conservative as they come and is not ashamed of it. I believe that people would vote for Sarah because they would be voting for someone whose principles are clear. There would be no guess work or wondering if the nominee would walk the walk as well as talk the talk. People are fed up with phonies and people who get elected only to turn around and be another Rhino. Sarah for 2016!! If Cruz is eligible, he could be the vice president! Submitted by efredfarm on Tue, 07/30/2013 - 13:50. Is he Constitutionally qualified to become President? I know his parents were not citizens when he was born, thus not fulfilling the Natural-Born Citizen requirement, found in Article II, Section 1, Paragraph 5. Many Tea Party patriots who have criticized Obama for being unqualified by not meeting this same citizenship test, would be hypocritical to support a conservative candidate who did not meet the same qualifications. Considering the high standard of ethics imbued in the Tea Party patriots, it would be logical to assume that they would not support Cruz for the same failure to the citizenship clause that they believe that Obama does not meet. It is one piece of controversy that we cannot afford to have on a candidate, or rest assured, WE WILL LOSE another election, and spend ANOTHER four years pontificating over the reasons why.